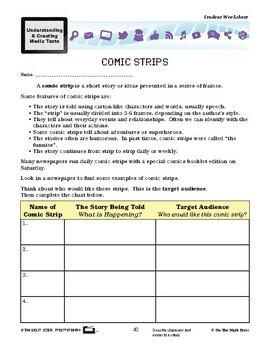 A comic strip is a short story of ideas presented in a series of frames. Activities include looking in a newspaper to find some examples of comic strips and completing the chart and creating their own comic strip. 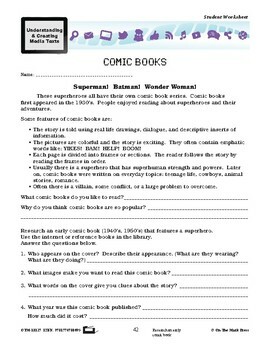 They will learn the features of comic books and answer questions and design a comic book cover of their own. 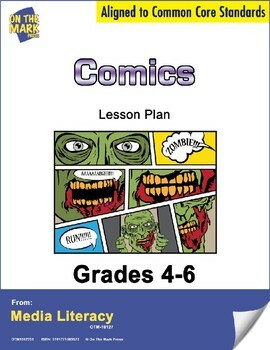 Meets Common Core by describing characters and events in a comic, creating a comic strip, researching an early comic book and designing a cover for a comic book.